Honey purchased from a store can be costly and may not fit into your grocery budget. One back-to-basics option is to try your hand at raising honey bees yourself using a standard top bar hive in order to harvest their honey. Attract a swarm of honeybees into your empty top bar hive by utilizing a few basic apiology techniques that will enable the bees to locate your hive. Place the top bar hive in a location where honey bees frequent. Open the lid. Some lids open in one piece, while other top bar hives have a dual lid. Place a few drops of lemongrass essential oil on the inner surface of the hive. Lemongrass essential oil will draw honey bees and make them interested in establishing a new hive. Close the lid on the empty top bar hive, and allow the hive to remain undisturbed for a couple of weeks. Repeat the process as needed until a swarm of bees has taken up residence in the top bar hive. Attempt to establish a honey bee population in your top bar hive after you have identified a swarm in your area. 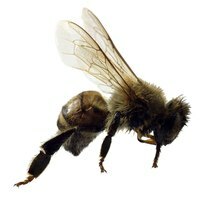 Do not try to raise bees if you are allergic to bee stings. If you are stung by a honey bee and start to have difficulty breathing or have swelling of the face, lips or tongue, seek immediate medical attention.